We are excited about our new program, Great Minds, that is available Monday though Friday from 12:00 – 3:00 p.m. and begins the second week of school. Parents can either sign a child up for a certain day or series of days for the entire year or make a reservation, if available, for a particular day on an as needed basis. 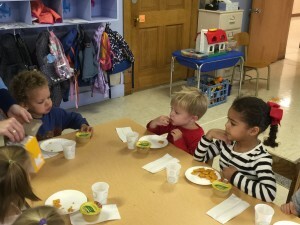 Children who are enrolled at Harvey Browne Preschool can also attend Great Minds on afternoons, even if it is not one the child’s regularly scheduled school days. Each day will be a themed based program offering either math, science, hands on games/activities, art, music and creative movement through centers and short circle times. Children will begin the afternoon with story time and lunch. (Their lunch is brought from home and must be nutritious containing foods from all four food groups — it needs to be in a clear Zip-locked bag with the child’s name and date clearly marked . There will be a short rest time and also play outside or in the gym.